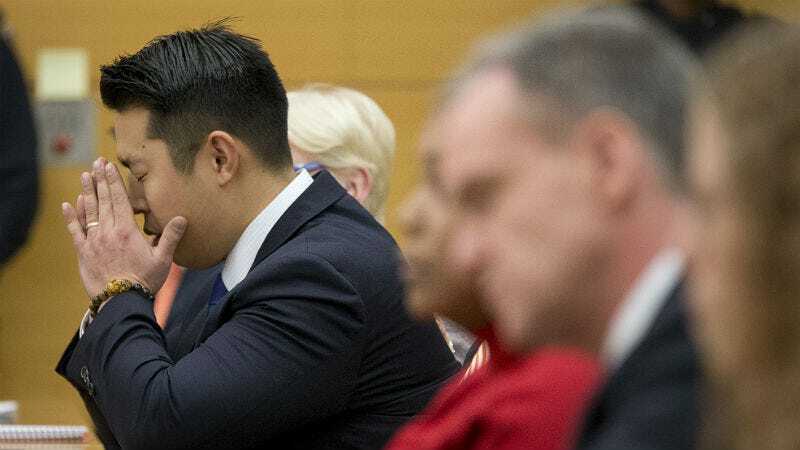 On Thursday, Peter Liang was convicted of manslaughter and official misconduct in the fatal shooting of Akai Gurley in 2014. Liang faces up to 15 years in prison, and is currently free on bail. Following closing statements by the defense and prosecution on Tuesday, the jury returned with a verdict late Thursday evening, according to the Daily News. Gurley’s family was grateful to the Brooklyn District Attorney’s office for the verdict, and also made it clear that it didn’t make up for anything. Liang is the first New York City police officer to be convicted of a “police-involved shooting” in ten years. Though the cases aren’t related outside of the use of excessive or fatal force by an officer on an unarmed black male civilian, Liang’s conviction appears colored by the non-indictment of (and consequent outcry surrounding) officer Daniel Pantaleo in the choking death of Eric Garner on Staten Island in 2014, even if prosecutors say otherwise. “This has to do with who are we here in Brooklyn. We support our police officers, but when innocent men are shot and killed through an act of recklessness, we have to hold whoever is responsible accountable, whether that is a police officer or not,” Thompson said. Liang’s sentencing is scheduled for April 14 and his lawyers plan to appeal their client’s conviction.